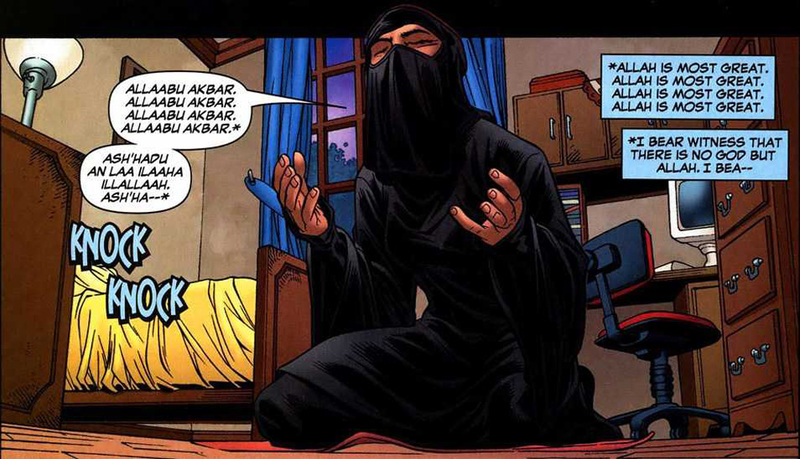 Another fictional Muslim character under the Marvel Comics belt is Sooraya Qadir, otherwise known as “Dust”. 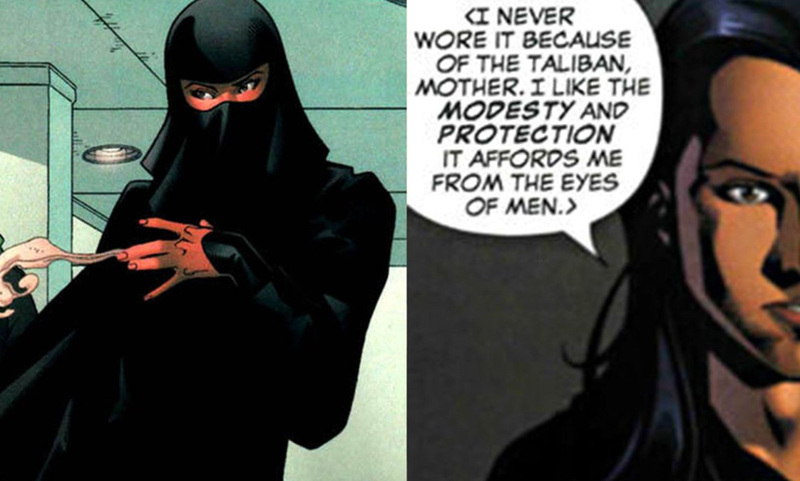 What makes Sooraya a character of interest is the fact that she is a niqabi heroine who fights baddies. Often appearing in X-Men related comic books, Sooraya’s is introduced when the X-Men travel to Afghanistan to rescue her from slave traders. 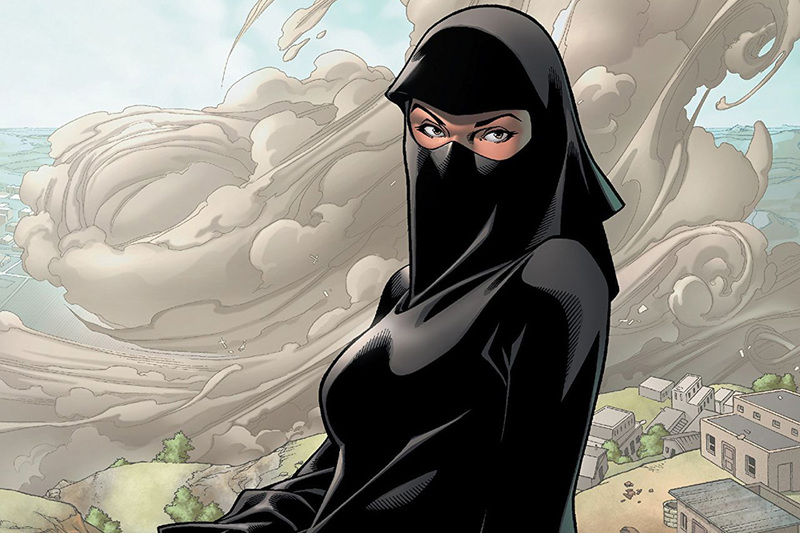 The Afghanistan born and raised Muslim female character’s story starts when she is attacked by a slave trader who attempts to remove her conservative niqab, and as this happens, she instinctively lashes out in self-defense and flays him alive with her power and ability to transform her body into a malleable cloud of sand-like dust. The X-Men hear of Sooraya’s power and struggles, and so, proceed to travel to the war-torn country to rescue her. 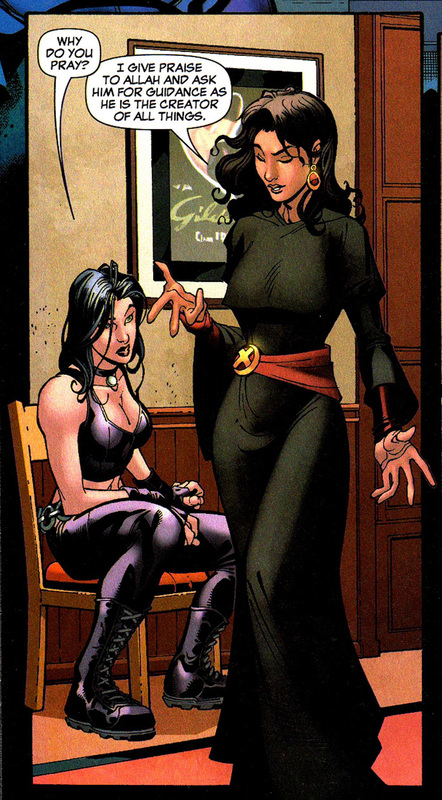 She then returns to America with the X-Men where she becomes a student of the Xavier Institute for Higher Learning. Sooraya is a mutant like the other X-Men and is currently a member of the Young X-Men Team. Her powers as “Dust” not only allow her to transmute herself into an explosive cloud of sand-like silicon particles and maintain control of her sand form, she can also reform her normal body at will or maintain a sand-based form in the shape of her human body. Dust’s incredible powers mean she is resistant to most injuries and her sandy form makes her almost impossible to detect by enemies. Being almost invincible, she takes down enemies by using her disposition to attack by scouring their flesh from their bones, as well as enter people's lungs and scouring them from the inside. Sooraya Qadir’s writer has her character down as a fiercely independent woman, whilst touching on social issues women in countries such as Afghanistan face. The creators of Dust, who are neither female nor Muslim, are Grant Morrison, a renowned comic book writer and playwright known for his nonlinear narratives and countercultural leanings, and artist Ethan Van Sciver.